It's quite late and I'm worn-out from traveling, but feel like I haven’t written in ages. Well, at least since last week. 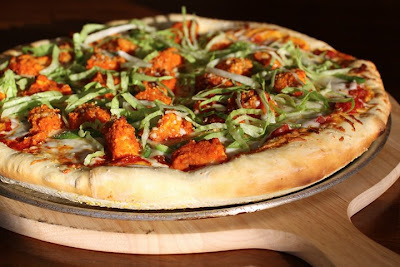 This past weekend was a lot of fun, and we kicked off the party Friday night with this buffalo chicken pizza cooked on the grill. I’ll leave you with the recipe before heading to bed. Zzzzzzzz…. Makes 1½ cups of pizza sauce. Enough sauce to cover three medium, or two large pizzas. 1. Make the Zesty Old School Pizza Sauce. Measure out 1 cup of the sauce and mix with 2 Tablespoons of Frank’s RedHot Buffalo Wing Sauce. Set aside. The extra sauce freezes well, or will cover another medium pizza. 4. Brush the pizza pan lightly with olive oil and sprinkle with cornmeal. Stretch and roll the dough and place on the pan. Brush with 1 Tablespoon olive oil. Spoon the pizza sauce around the dough. 5. Top pizza with the mozzarella, buffalo chicken pieces, green bell pepper slices, blue cheese, dried parmesan, and a sprinkle of salt, pepper, & garlic powder. 7. Sprinkle with shredded lettuce, cut into wedges and serve. Notes: See http://www.thecookingphotographer.com/2009/04/lets-talk-dough-pizza-dough.html for information on pizza dough and grilling techniques. Laura. This piizza sounds wonderful. My children adore buffalo chicken, I bet theyd dive into this! I make something similar- I'll have to try this verson. Your photo is beautiful. Laura, this sounds wonderful. It also looks wonderful. Thank-you Sherri. Pizzas are always difficult for me to shoot. Your comment was really nice to read. Yum! My favourite kind of pizza! Looks great! I'm glad you're catching up on some rest! IT's always much-needed after holidays! This pizaa looks like the perfect way to kick off a party! Oh wow... hubby would LOVE this! What a hearty and delicious looking pizza. I'm adding this to our menu, definitley! Thank-you for the comments. I've enjoyed reading them today!